After a quick perusal of Daft.ie, it’s clear that the rental situation in Dublin is an absolute catastrophe. 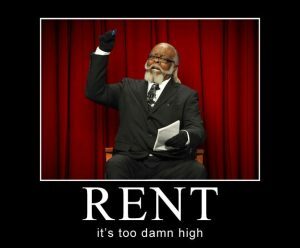 Rental prices have gone through the roof. Literally, garden sheds and one-car garages are now going for 900 Euro per month and more. Prices are up more than 30% from their lowest point, and they are now higher than they have ever been, even during the Celtic Tiger. To add insult to injury, you would be hard pressed to find a place to rent even if you could afford one, perhaps by packing in like sardines. The recent saville report says that vacancies are now below 1.5%. Economists are fond of telling us that it’s all about supply and demand. And of course they are right, but if one is to believe the story of the invisible hand, efficient markets and all the rest, increases in price are supposed to create supply to meet the demand. So why is it that the rental market is so tight, new housing units are not being built, and we’re not only finding things unaffordable, but unavailable in the first place? David Ricardo, a disciple of Adam Smith, the father of modern economics, decided to take up a similar question in 1817 when he was studying the question of prices of agricultural products. Adam Smith’s theory had said that the price of a good was given by the amount of labour that went to produce it. However, land, a critical component of agricultural production, cannot simply be produced in a factory and according to Ricardo, the price of food will be impacted by with how much it costs to bring suitable land into production. This is known as the theory of marginal production. The idea is as follows. To make wheat, you’ll need some inputs: seeds, fertiliser, human labour and land. Each of these you are going to have to purchase, as a commodity. If you total these costs up, you need to sell your total output at more than the costs, or you lose money. When there is relatively more land available, you can sell at a relatively lower price, as land will be cheap. As land starts becoming scarce, the cost of wheat will increase by the amount to bring into cultivation the next plot of land, that is, the land at the margins. This might require terracing a mountain, or dredging a swamp, and in the end will probably have a lower productivity per hectare. Bringing this new land into production is expensive, and it requires that the price of wheat is higher than our total costs. The situation with rent follows the same basic principle because of the non-reproducibility of land. There are landlords who purchased decades ago, who have tiny mortgages are akin to the farmers producing wheat on the high productivity land. The fact that it’s cheap for them, does not set the price. They can be making money hand over fist, but the new producer is the one who has to be assured of profits before supply increases. Ok, so this story might make sense logically, but is it empirically true? What do rental prices look like, compared to the cost of building new housing when financed at market rates? Society of Chartered Surveyors in Ireland, overall build costs of a three-bedroom semi-detached residential home in Dublin was more than €330,000. Of that cost, over €57,000 is land cost. The cost of apartments is even higher per unit, with increased cost in shared infrastructure and parking, although the overall cost of land per unit will decrease. If we imagine that we have an institutional investor, who is building houses in order to rent them, we might expect they could avail of “cheap” finance at something like 3% over 30 years, so we’re talking about re-payments that are around €1390 per month. And that is in fact about what the rental price is out on the margins of the city in Finglas, Lusk or Clondalkin. The reward for a new investor is only going to be relatively small profits, not the enormous amounts which accrue to the long term landholder. And because of this, there is no huge rush to increase the housing stock from investors. Even worse, once building does become profitable, it can take a long time before the new supply becomes available, since building takes time. This means there can be a serious lag where rental prices increase, even after it is financially viable for investors. When we look at houses closer to the city centre, the rents can exceed the above numbers by quite a lot. The price of the next unit is almost meaningless as there simply aren’t many more places to put new units and investors can not easily find any land suitable for a substantial development. So if we’ve established why the rents are so high, what are we going to do about it? If it’s not a market failure, but rather a market fact, maybe it’s the market which is the problem. The vast differences between the rents derived from landlords who already hold property and those who are building new property gives some indication that the problem is one which needs to have a collective management solution. The Housing Authority suggests we will need another 80k units of housing nation-wide by 2018. This is going to require a large-scale building programme. This would have to make use of elements only the state has at its disposal. Namely: the ability to use already existing state land, the ability to obtain financing at much lower interest rates than can be obtained by individual investors or builders, the capacity to zone and plan for proper amenities, and the ability to make use of extraordinary legal powers such as compulsory purchase orders or to institute new legal regulations about the use of derelict land or housing which include seizure for failure to develop. In addition the state can utilise the fact that some housing will be cheaper than others to bring into use making a big building plan more financially viable. Our problem is the market itself and the way to deal with it is to stop trying to solve the problem through the market. The solution is to take land and housing into public ownership and view house building as a public enterprise. When, in the 1920s, Vienna had an extreme housing crisis, the municipality took matters into its own hands and begun a very ambitious building programme which ultimately build some 60,000 houses in Vienna which were entirely public, but which were mixed income and focused at the broad population. They funded this project out of a combination of a newly instituted builder-tax combined with a wealth tax. This Red Vienna period laid the foundation for cheap publically managed housing that has lasted to the present day. In fact, fully 30% of the stock in Vienna is managed by the municipality and over 60% is social. It is no accident that Vienna is the European city which has the highest quality of life virtually every year. Why not make Dublin one of the cities with the highest quality of life in Europe, by following a similar plan?